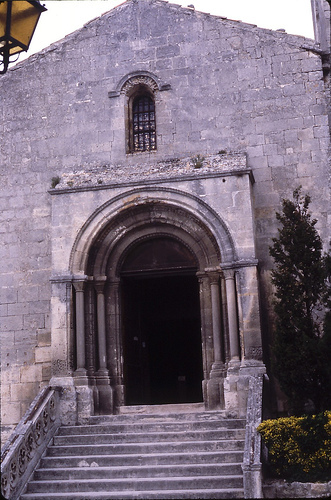 The church of Saint Vincent is one of the oldest monuments in the village. The church is located on the "Place Saint Vincent". This monument is square and east-west oriented. All the churches of the Valley of the Baux are laid out in the same way, in perfect accordance with Christian symbolism, which places the facade towards the sunset from where darkness comes and the altar in the direction of the light, symbolising Christ. The church has three naves. The left-hand nave, the primitive church and the oldest part, dates from the 10th century. Its semi-circular vault is decorated at source with triangular festoons characteristic of the Carolingian period. This nave has three chapels cut into the rock. The main Romanesque-style nave dates from the 12th century. In 1550 a gallery was added above the entrance. Above the main altar there is a fine painting representing the judgement and sentencing of Saint Vincent as a martyr. The right-hand gothic-style nave to the north of the building is composed of 3 chapels, one of which houses the Manville family cenotaph, which possesses a flamboyant Gothic vault. The Prince of Monaco - Marquis of Les Baux, donated the magnificent modern stained glass windows by Max Ingand (1955). VAL D'ENFER, on the south face, there is a circular turret capped by a dome decorated with a gargoyle - the lantern of the dead - in which a flame was lit to announce the death of an inhabitant of the village.